Public transport passengers will be hit with steep hikes of up to 13pc in their bus, rail and tram fares from next Saturday. The National Transport Authority (NTA) has approved a range of fare increases across all public transport operators, which will hit commuters already reeling from a series of hikes in recent years. Fares have risen by almost 40pc for some services since 2012, and monthly and annual tickets across most operators will rise from November 1. Changes to Leap fares, cash and other tickets take effect from December 1. The NTA said the increases were needed due to repeated cuts in government funding, falls in passenger numbers and higher fuel costs being incurred by the operators. Some fares will reduce, in some cases by up to 25pc, but most will increase. The NTA insisted that passengers who switched to the Leap smart card would achieve savings of up to 20pc, and that these fares compared favourably with cash fares in place in 2012. But the hikes were criticised by the opposition who said it would drive passengers from public transport services to the private car, with the Green Party saying investment in public transport had been slashed in recent years, and that the system was becoming "ever less appealing" as fares rose without any discernible improvement in services. Fianna Fail questioned if the NTA was protecting the consumer. "This latest round of price hikes raises serious questions about the role of the NTA," transport spokesman Timmy Dooley said. "The authority is supposed to protect the consumer, however over the past number of years it has approved a series of fare increases across all modes of public transport, forcing the customer to fork out once again. "The NTA should be encouraging people to use public transport instead of making it less cost effective. "With the increase in people returning to work, transport companies have an opportunity to capitalise on new commuters, however, these consecutive price rises are actually deterring customers, and in many cases people are opting to use their cars." NTA chief executive Gerry Murphy said that most fare increases applied to cash fares, with "modest" hikes in the Leap card. The transport authority says that 50pc of all journeys made in the capital use the smart travel card, with 750,000 now issued, and that it wanted to encourage further use as it reduced costs for the transport companies and improved journey times, as it was quickly to board buses. Leap is being introduced in Galway and Cork this year. "Fares are going up because costs are going up, and subvention was cut severely during the economic crisis," Mr Murphy told RTE. "One of the features is we are trying to encourage Leap Card use. 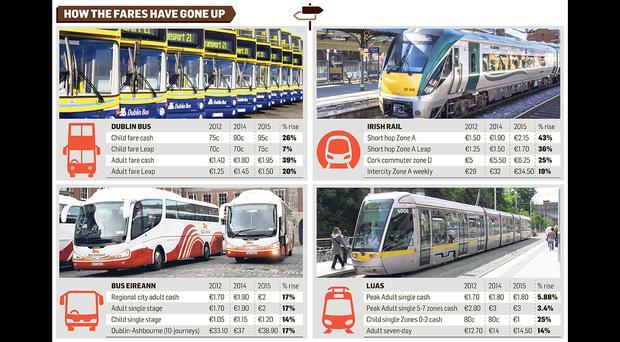 The fares in 2015 are cheaper by Leap then were by cash by 2012. "Essentially there's a 20pc differential in Leap if paying for a single ticket. In many cases, it's cheaper to use Leap then buy a pre-paid weekly ticket. We're trying to encourage people to use Leap because it's a faster way to collect fares and reduce boarding times. It encourages people to get off one operator and get onto another." Passenger numbers have grown by 4pc so far this year, driven by a better network and other improvements including Real Time Passenger Information and Wi-Fi. The authority has also announced a second journey discount on Dublin Bus to take effect by the end of the year, to be extended to all operators after. A lower fare will apply when a second trip is taken within 90 minutes of the first. The second journey will cost €1 for adults and students, and 70c for children. In addition, the child Leap card has been extended from 16 to up to 19 years, in order to target school pupils. The NTA said that some fares were being cut as part of an ongoing review of the fare structure. Some 10,000 fares currently exist across the public transport companies, which are being reduced over time with "illogical fares" and pricing being eliminated. Some fares cannot be increased unless the Leap card is available, the NTA added. Rachel Farrell MET Éireann has warned of hail and thunder this evening as Ireland is set to be hit with 'Storm Hannah' this weekend.